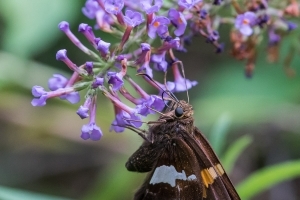 Fortunately for me, there’s a “butterfly bush” in one corner of our neighbor’s backyard that attracts swallowtails and other species. 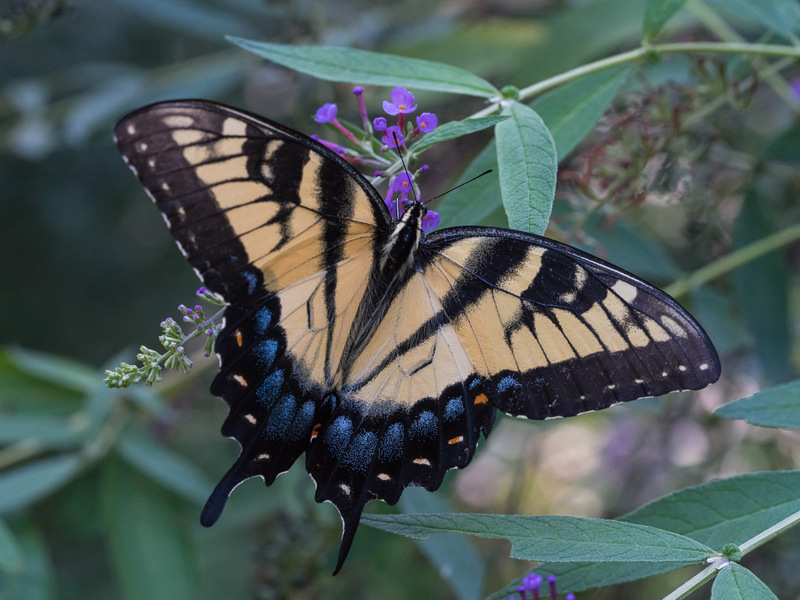 The large yellow swallowtails have wingspans ranging from 3″ to almost 6″, making them more like small birds (to photograph) than insects. In good light, the inherent contrast in their coloration makes them easy targets for autofocus (AF). As with any wildlife photography, it’s important to study your subject and learn from its behavior. Insects are no different. I’m not an entomologist, haven’t read any books on the subject, and none of this is very scientific. 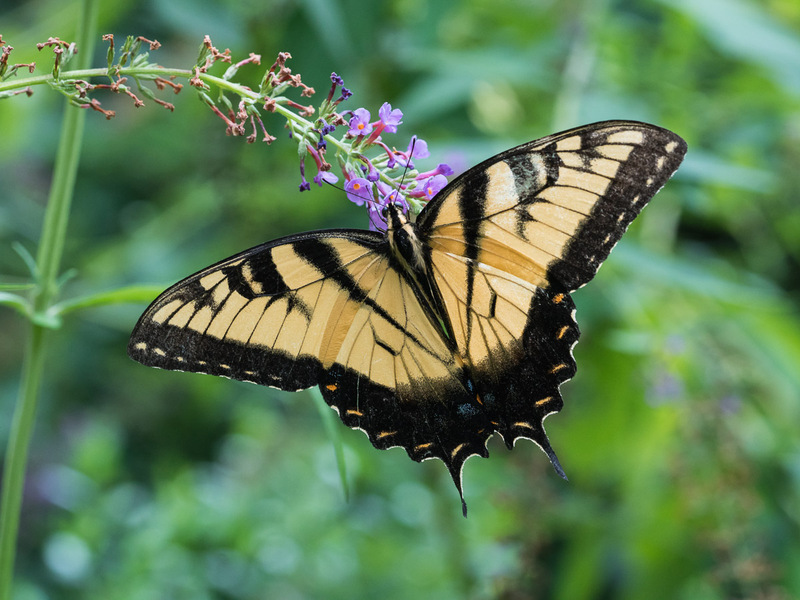 Here are some of the things I’ve observed this summer about butterflies. 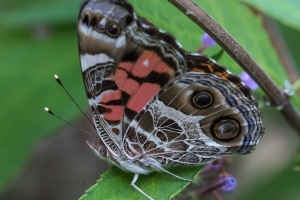 Instinct ≠ intelligence – Butterflies, and perhaps all insects, are instinctive and not intelligent in the human sense. They repeat the same behaviors and become predictable. They are motivated by feeding, mating, and egg laying. And they seem to be unaware of predators like garden spiders. 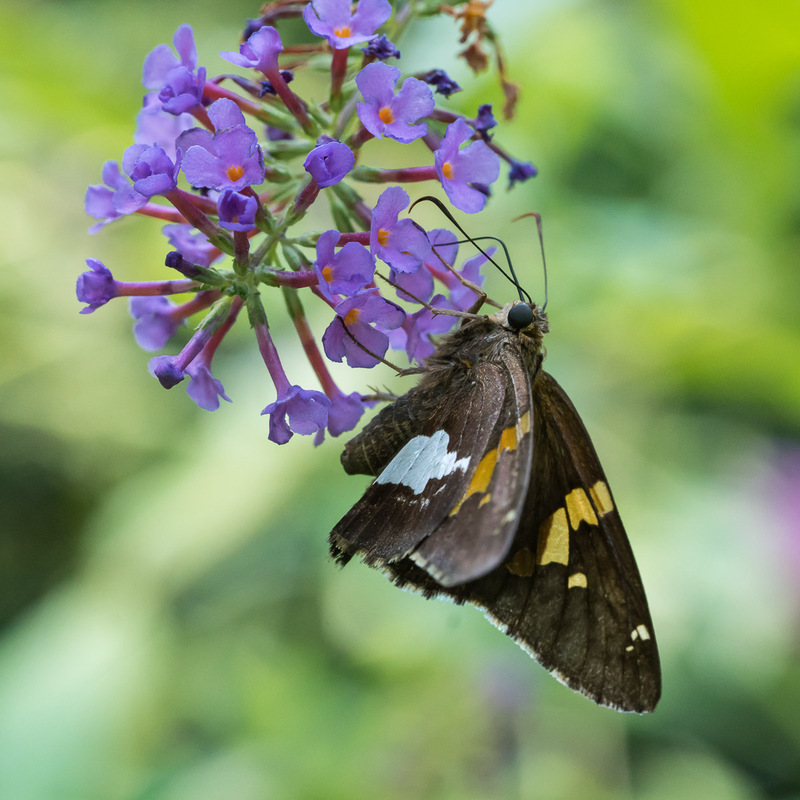 Coloration ≠ camouflage – The big yellow butterflies are easy to spot. I see them when I’m even indoors as huge yellow critters flying against a green background. Maybe somewhere they blend in, but not here. 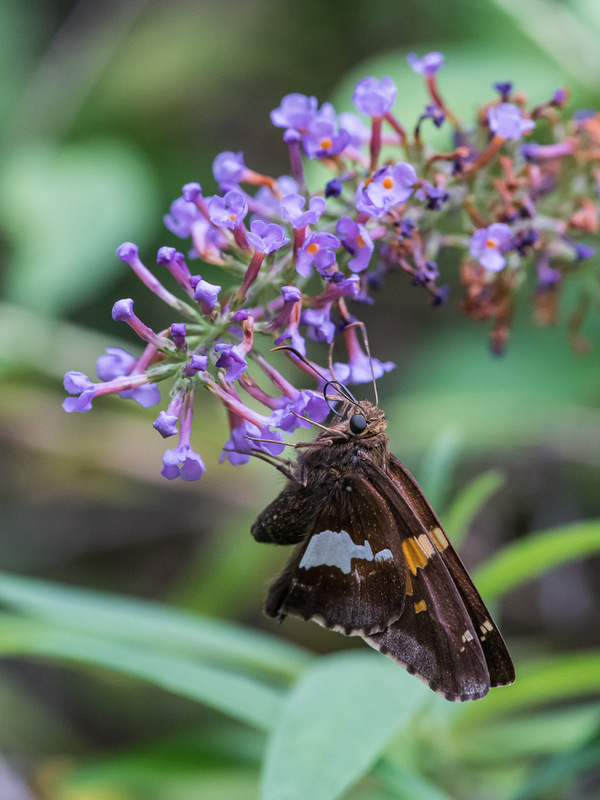 Skittishness is inversely proportional to size – It takes patience to get close enough to small butterflies to get a decent photo. They seem intimidated by my presence. Conversely, I can almost touch the large ones with the front element of my lens. 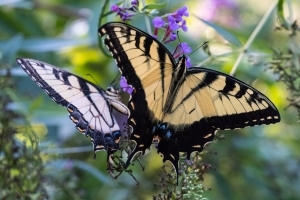 Learn the comfort zone for the insect you’re photographing. Shutter Speed – 1/500 sec. I also use back-button focus, preferring that to the default half-press AF of the camera’s shutter button. I let the ISO float up to 6400 (set as maximum ISO in the Auto ISO menu), given the camera’s excellent high ISO performance. Watch before shooting. Study which flowers the butterflies frequent, what the background is, what the lighting is, and how long the insects remain on each flower before moving on. 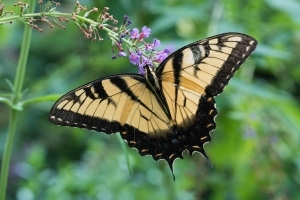 Observe how the wings of the butterfly catch the light. Coloration is often subtle and often more vibrant when lighting is at a certain angle. Beware biting/stinging insects. Wear long sleeves, long pants, socks and shoes, and use insect repellant. Mosquitoes are more than a nuisance in central North Carolina during the summer, and ticks are plentiful, too. Focus on the eye(s). As with photographing other wildlife (and people), get the eye(s) in focus. Move the camera’s focus spot around to ensure a sharp capture. 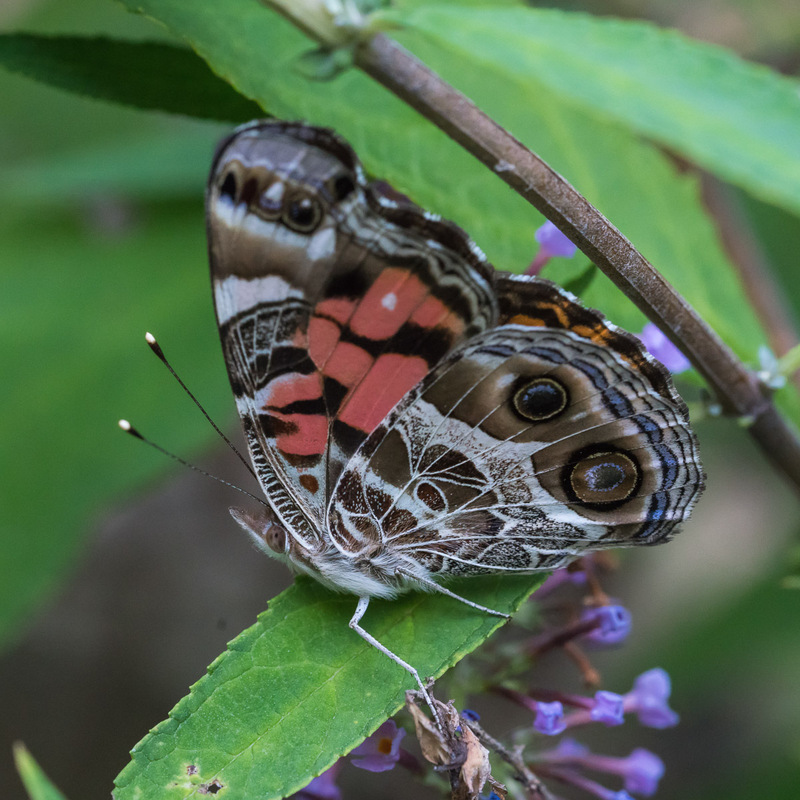 Even stopped down to f/8, getting the entire butterfly in focus is impossible because the depth of field is extremely shallow at these working distances. 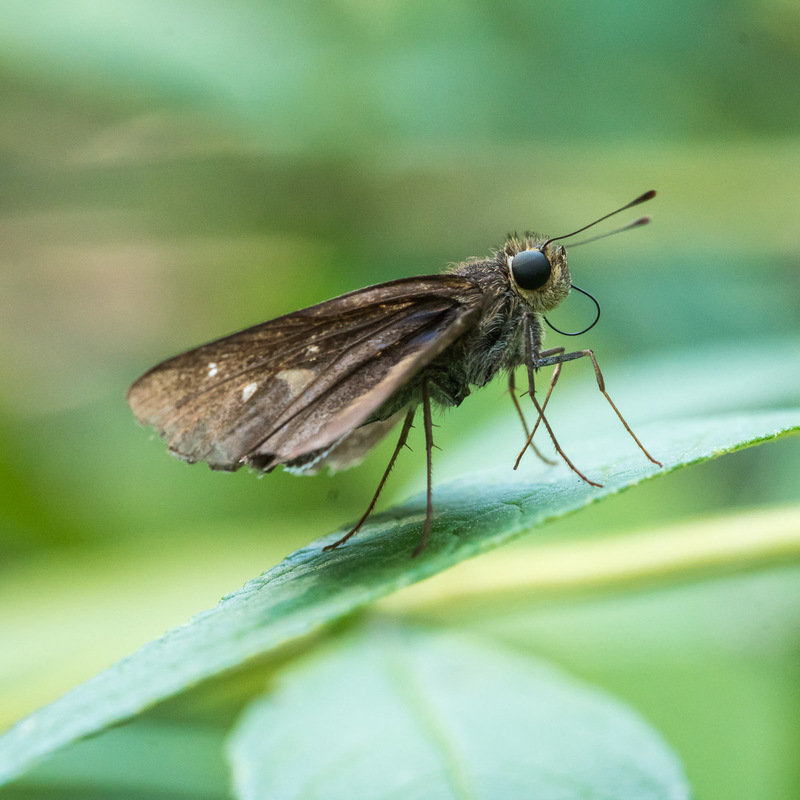 With the 42MP a7R II, cropping is not only OK, but likely necessary when photographing small insects. 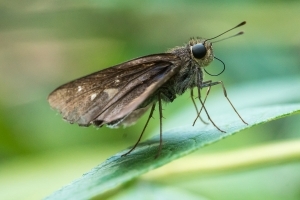 For Web display especially, cropping to illustrate the detail and color of the insect is more important than saving all the pixels. I use Adobe Lightroom (LR) as my processing and cataloging application. In order to simplify my workflow, (after culling) one of the first steps I take is to add keywords to each image. Then I use several Develop module presets to establish a baseline or starting point. 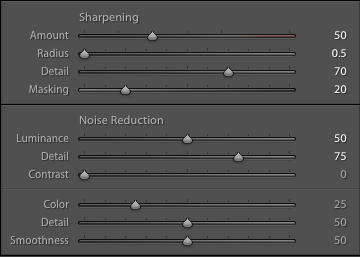 The following LR settings are only a starting point, but usually take me 90% of the way to a final fully-processed image. 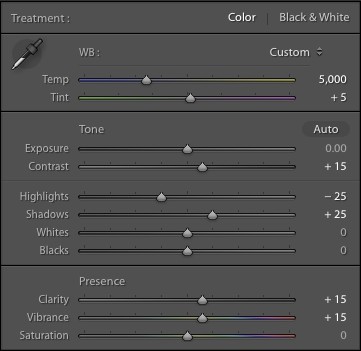 After applying these baseline settings, I adjust the Whites slider, Blacks slider and occasionally the Exposure slider. My standard deconvolution sharpening settings for the a7R II are 50, 0.5, 70, 20. For ISO 3200 to 6400, my Luminance Noise Reduction setting is +50. That setting is usually sufficient to render the image smooth and noise-free. Finally, below are several photos from this summer’s experience. 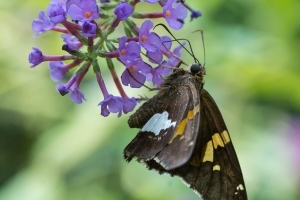 More images are in my Butterflies & Moths gallery. Except for the all too frequent mosquito bites, it was fun and educational. I hope that this will encourage you to explore the world in your own backyard. And use the Sony a7R II. This entry was posted in Uncategorized and tagged a7RII, Adobe, Butterflies, Lightroom, Moths, Photography, Sony.